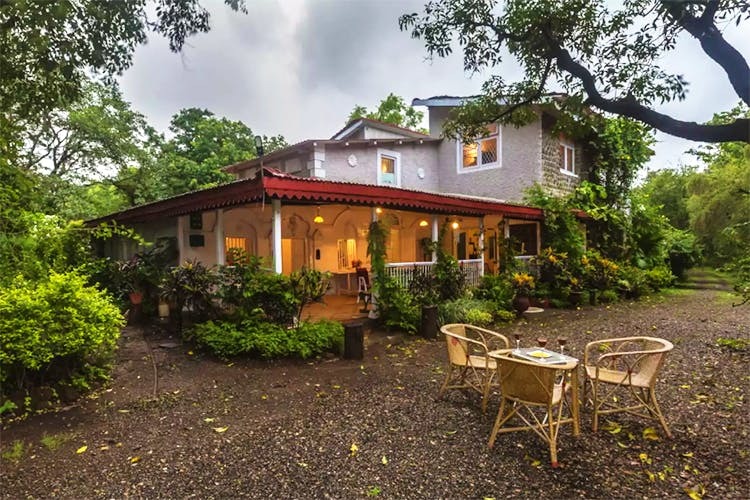 Sprawling across 14 acres of land, Firdaus Baug in Kamshet is the quintessential country-side bungalow with 12 spacious rooms, a sit-out setup by the river and more. Firdaus Baug is located at Nane Road, next to Sadik Watch House in Kamshet, which is about one-and-a-half-hour from Pune via NH48 through Kusgaon Road. Firdaus Baug is a heritage Parsi villa with bedrooms beautifully done up with poster beds, bright curtains and antique decor. The bungalow also has a well-manicured orchard, an outdoor setup with swinging chairs by the Indrayani river and an indoor game-room with table tennis and carom. Additionally, there are verandas too, furnished with charming patio chairs and long wooden benches. We think the bungalow is absolutely ideal for big families who want to take a break from the city life, turn off internet and spent quality time in a peaceful, hindrance-free ambience surrounded by greenery. The villa has four rooms that can easily accommodate 12 guests. Pets are welcome, however they aren’t allowed on the ground floor. Price per night at Firdaus Baug is INR 19,971. For bookings and more details, get in touch with Tejas (host) here. Before summer ends, plan a big family vacation at Firdaus Baug.